I don't usually post recipes without pictures, but I had a request for this one, so here it is ! Pics next time I make this, which will be soon ! I was craving Indian food, we hadn't made any for awhile, so I thought I could make some tikka masala. The problem was, I wasn't planning on being home, and my traditional way of preparing this is a little time consuming. I wanted to be able to come home, dish up dinner and eat, which is what crockpot meals are made for ! I was a little apprehensive about putting this is the crockpot, I had no idea how it was going to come out. Answer: YUMMY ! The chicken was super tender, and the sauce was perfectly seasoned. I am not sure if I will go back to the other preparation, this was so easy and good ! The night before, combine ginger, garlic and yogurt. Sprinkle chicken with salt and pepper, then toss in the yogurt mixture. Refrigerate overnight. In the morning, place chicken in the bottom of the crockpot. 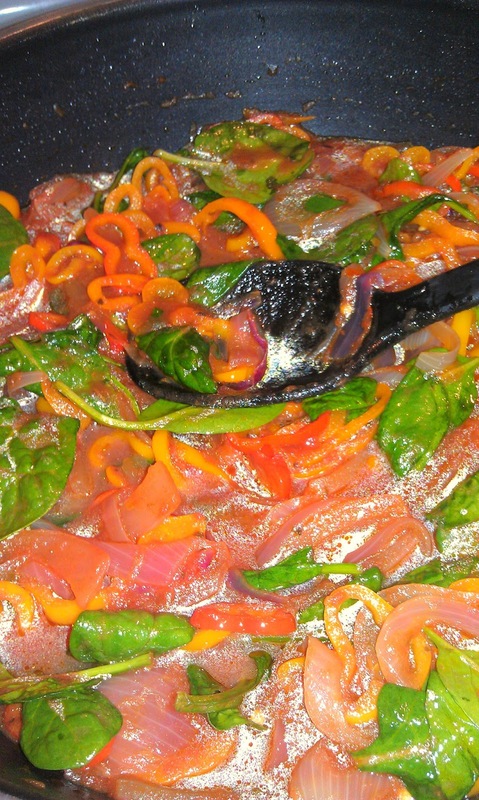 Top with the serrano peppers, then the spices. Scatter tomatoes over the top, and set heat to low. Let chicken cook 4-5 hours, then stir in the tomato paste. Cook an additional 1-2 hours. Stir in the heavy cream just before serving. Serve with basmati rice. Did you ever make a mistake ? Well, this is one that fortunately came out quite nicely. And it was completely unintentional. And no, I wasn't paid for the free ad, but it is really amazing on ice cream, you should try it ! In a small saucepan, bring milk to a boil, then remove from heat and let come to room temperature. In a double boiler, combine egg yolks and garam masala sugar,and whisk slowly over simmering water until egg mixture starts to thicken. Gradually whisk in the milk, and continue to cook and whisk until thick. Surface wrap with cellophane and refrigerate until cold. 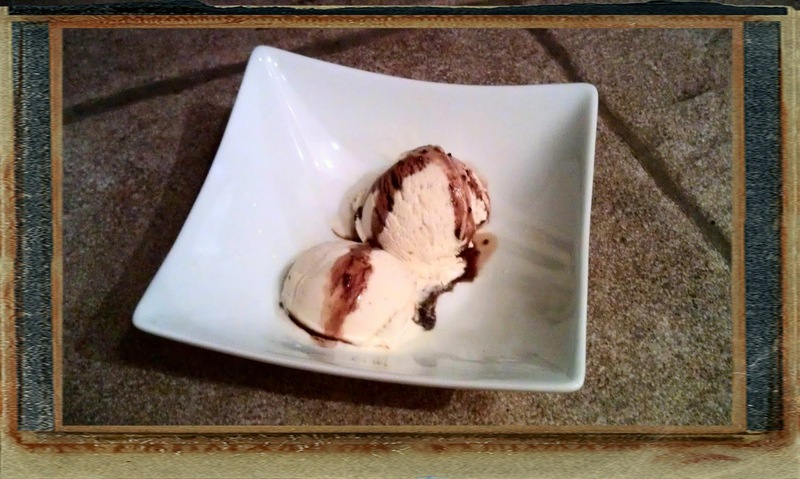 Combine egg custard, cream and vanilla, and process in an ice cream maker according to manufacturer's directions. Place ice cream in the freezer, and freeze until firm, approximately 2 hours. Serve with Blaak Drizzle. We were celebrating the 4th anniversary of our first date, and wanted to try somewhere new for dinner. I had heard about a new place near our home in Crystal, and thought we should give it a try. I love supporting local, non-chain restaurants, and quite frankly we don't get the opportunity to do that in Crystal or the northern suburbs as often as I would like. I haven't done a food review for awhile, mainly because we haven't been anywhere new or noteworthy, but that changed on Tuesday evening. Milton's is in a very unassuming strip mall, just off 36th and Douglas in Crystal. Surrounded by dance studios and hair salons, you would never guess this quaint little spot was nestled in the middle. 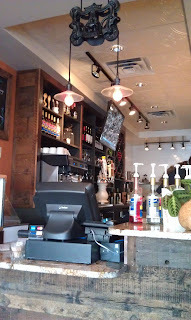 When we walked in, it as a bit confusing at first, but we rounded the corner and headed to the hostess/bartender/server and asked about a table. We were told it would be a 15-20 minute wait. Business looked like it was flowing, for 6:30 on a Tuesday. The restaurant was packed with families, couples and one large group. I always think if a restaurant is busy, that's a good sign, right ? We were offered a "high top" table, which was really two stools near the back, and given menus. The owner (I believe) or someone very knowledgeable about the beverage service, stopped by and discussed the craft beer selection. While not extensive, they do have a nice mix of local and national beers, and it sounds like he is working to increase the selection daily. That appealed to me right away. He even brought us over a sample of the Deschutes Chainbreaker White IPA, which was a nice, solid selection for dinner. 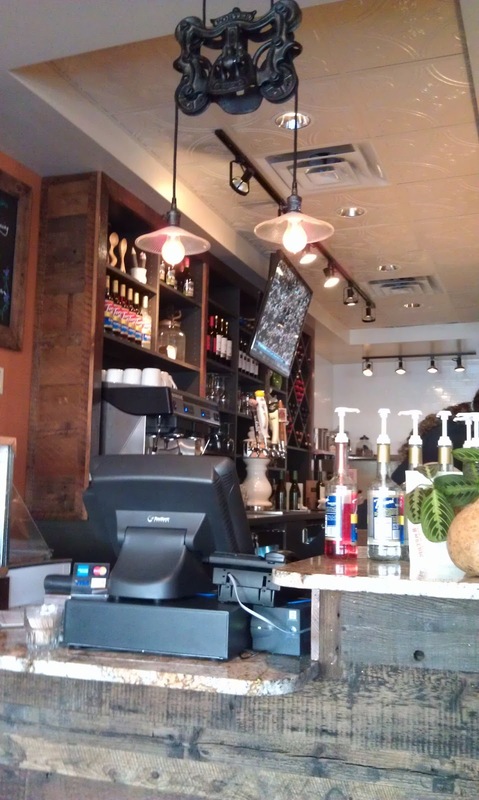 The menu at Milton's VVB (which stands for vino, vittles and beer) is not extensive. But. there was enought variety there for us to make a good dinner selection. We decided on a caprese salad to split as an appetizer. It was the perfect size for a starter, although it would have been good to note we were also getting a salad with our meal. It was lightly dressed with balsamic vinegar, and just a sprinkle of bacon on top of some field greens made it quite nice. So far, we were impressed. These are really nice ribs. They were smoky, with a nice spicy (but not overly so) rub. They served their barbeque sauce on the side, which I very much liked, because then we can choose the amount of sauce on each bite. The actual sauce was very unusual, more toward a Carolina style, with a good vinegar kick and a hint of sweetness. For my palate, anyway, it was perfect. The apple salad on the side was interesting, but nothing special. A mixture of cheese, apples and some herbs, it was good but not great. 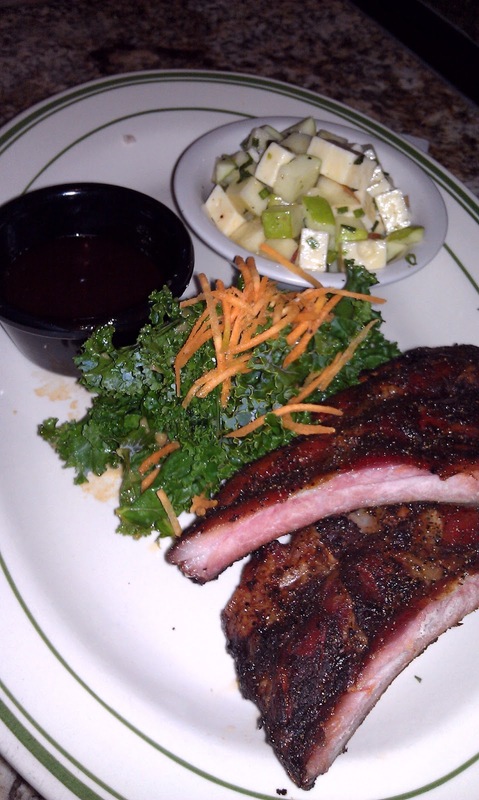 Which, at this point in the meal didn't matter to us, because the kale was amazing ! I am not a kale lover, so the fact that I even wanted to eat more of this is testimony to its greatness. Perfectly cooked, served with a lightly seasoned sauce, after trying it, Ray wished he had asked for extra kale as a side dish on his dinner, rather than the apple salad. 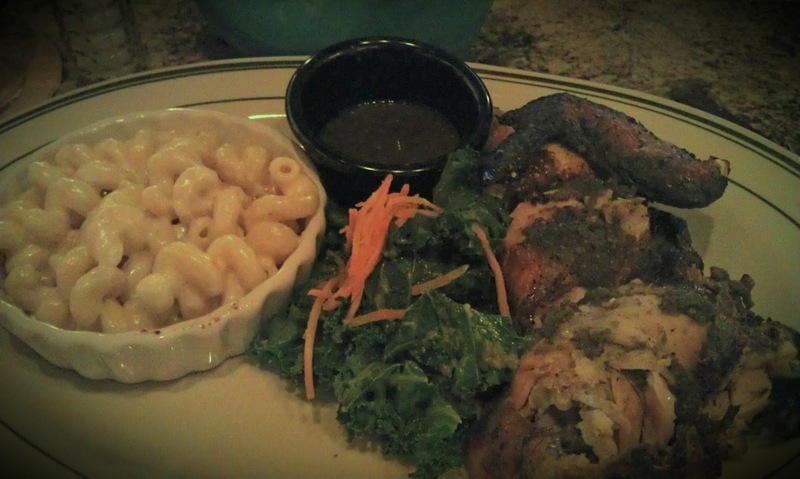 I chose the jerk chicken, which appeared to be a quarter of a chicken, grilled and lightly seasoned with a jerk sauce. They also gave me extra sauce on the side, in case I wanted it spicier. I didn't think it needed anything extra, it was perfectly cooked, moist and flavorful. I also had the same amazing kale on my plate, and a side of their mac and cheese. I liked the mac and cheese, Ray thought it needed more cheese sauce....then again, he is used to eating mine, so the comparison isn't fair as I tend to "over-cheese". I thought the balance on this was nice, although it could use a little something to make it more unique, like bacon or jalapenos or something. And one stand out for me, was the homemade green goddess dressing on our salad. It was light, flavorful and perfectly seasoned. The fact that I didn't put salt and pepper on my salad (which I almost always do) shows how much I enjoyed it. All in all, we were pleasantly suprised by our evening at Milton's VVB. We really, really wanted to try the desserts, but were just too full to do it. They have a bananas foster, and chocolate rum cake that both sounded excellent. And dinner for two came in just over $50, which is almost a record breaker for us ! I love appetizers. They are probably my favorite part of a meal plan, next to desserts. And we love homemade hummus, but I have brought that to parties so many times, I wanted to make something different. At the store, they often have hummus combined with olives, or sun-dried tomatoes, or feta cheese. When I started planning how to "amp-up" my hummus, my mind went to those, and then skipped over to that old stand-by Mexican Seven Layer Dip. Everyone knows the one...beans, sour cream, cheese, lettuce. I was sure I could figure out how to make that with hummus as the base. I have to say, this was one of the simplest, but most elegant looking plates I have done for awhile. The picture probably doesn't do it justice, but I was trying to show all the different layers in the dip, and the only way to do that is to eat some first ! Key to this dish is the homemade hummus. Of course, you can buy it at the store, but it is so easy to make, once you have done it, you will never buy it again! Place the chickpeas in a saucepan, cover with 2 inches of water, and let soak overnight. In the morning, rinse the chickpeas and cover again with 2 inches of fresh water. Bring to a boil, then reduce to a simmer, and simmer an hour or more, until the chickpeas are tender. Rinse and let cool. Place chickpeas and garlic in a food processor, and add half of the lemon juice and half of the olive oil. Process the chickpeas, adding additional liquid until the mixture is smooth. In a pie dish or large, flat container, spread about 1 inch of hummus. Combine yogurt, dill and mint together, and spread on top of the hummus. Top with spinach, then onion, tomato, olives and feta cheese. Refrigerate until ready to serve with pita chips. As painful as it is for me to admit it, I made a really, really terrible beer earlier this year. It tasted good when it was time to bottle, which doesn't normally happen. Usually beer tastes pretty thin and nasty before you have the chance to bottle condition it. This one was different...I should have known. After 4 weeks in the bottle, we opened one and all you could smell was the cardamom! My beautiful, delicious Christmas Ale was ruined ! The taste is almost like perfume, it is literally undrinkable (unless you were dying of thirst, then maybe). But, I am stuck with a bunch of it, so what to do ? I have made this beer bread before, and one of the great things about this recipe is that you can change the character of the bread by your choice of beer. So, it doesn't matter what kind of beer you use, and you can add additional spices, cheese, bacon, whatever you might like. 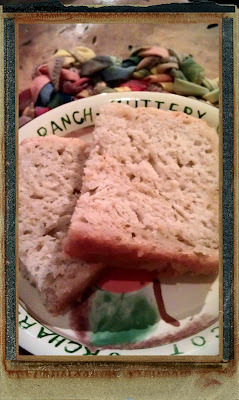 Luckily for me, the bread tamed down the cardamom a bit, and the bread is really moist and scrumptious. Since we have so much of the cardamom ale left, I think we will be eating a lot of this bread. Good thing it's quick to throw together ! Preheat oven to 375. Sift together the dry ingredients in a large bowl. Slowly stir in beer, and mix just until moistened. Spray a 9 by 5 loaf pan with non-stick spray, and spread dough into pan. Top with the melted butter. Bake for 1 hour until top is golden brown. Let sit 15 minutes before removing from pan. Last year about this time, a friend told me about a traditional dish served for Persian New Year, rice and white fish, with an unusual blend of spices. I attempted to make it, and was fairly successful, although I think I was lacking in technique a bit with the preparation of the rice. It is supposed to get nice and crispy on the bottom, which is really one of the best parts of the dish. 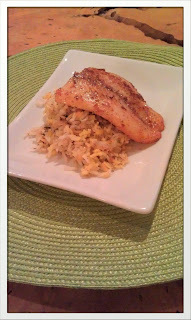 When I was preparing my menu this week, I started thinking about that rice again. Unfortunately, I used up some of the ingredients I would need in previous dishes, so I had to change it up a bit, but I still like this dish a lot. The way you cook this rice is different from your usual preparation, you basically steam it with the vegetables and herbs, and it becomes very moist and fragrant. 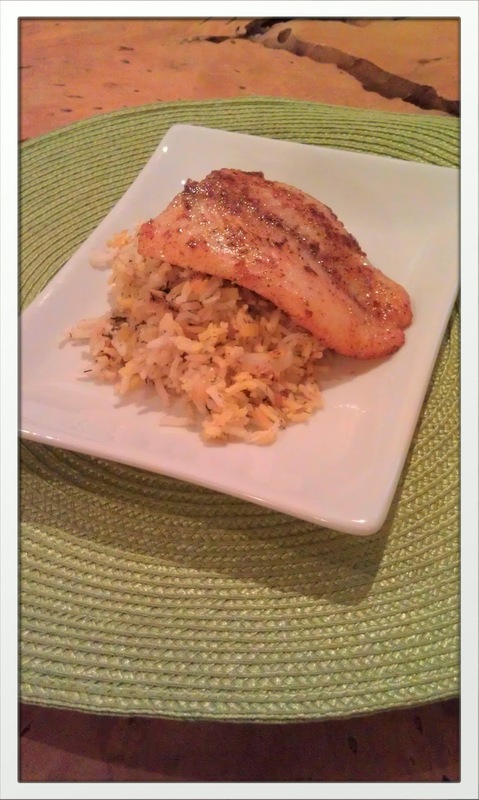 I decided to spice my fish with ras el hanout, because it had some of the same flavor notes as the spices I used in the rice, and it was a really amazing combination. One of my friends pointed out that my fish filet looks a bit like a tongue, which it does, but I promise, it is just a nice piece of swai ! In a large, non-stick pot, bring 4 cups of water and 1 tablespoon salt to a boil. Add rice and boil for 10 minutes. Drain, and rinse with warm water. In the same pot, melt half of the butter, and add half of the saffron mixture. Layer 1/3 of the rice, 1/3 of the onion and garlic, and 1/3 of the herbs and spices. Repeat until you are out of ingredients, ending with the spices. Top with the remaining butter and saffron. Place a lid on the pot, and place a towel over the top to prevent any steam from escaping.Cook over medium heat for 10 minutes, then simmer for 50 minutes. During the last 10 minutes of cooking, start the fish. Season filets on both sides with ras el hanout, salt and pepper. Start a large non-stick skillet over medium heat, and combine butter and olive oil. When pan is hot, add filets, and cook 4-5 minutes on each side until just opaque. Remove from heat, and serve over rice. It occurred to me as I was making this dinner last night, that my last several posts have been about using up leftovers from the refrigerator. It must seem like all we ever eat are leftovers, so where are the firsts ? When you craft a lot of your own recipes, you tend to create some core favorites, which we work into a "rotation" of sorts, so rather than bore you with reposting them, we just eat those. But, that results in leftovers, which need to be used up, and that creates some new, favorite recipes. This is going to be one of those. We made a giant batch of marinara sauce in the fall, and froze some along with pre-made meatballs. Normally we would make pasta and serve it all together, but Ray was having a bachelor weekend, and decided he wanted meatballs sandwiches. So, he extracted the meatballs from the sauce, which left a good portion of thawed out sauce to be used for something else. We are kind of purists when it comes to our homemade marinara sauce, we don't like to use "cheap" store bought meats, since we worked so hard making it. I had to come up with a way to repurpose it that still made using of its really amazing flavor. I starting thinking about the peppers and onions they often serve on top of Italian sausages you get at ball parks, and that's what I used to make the sauce a bit more robust. 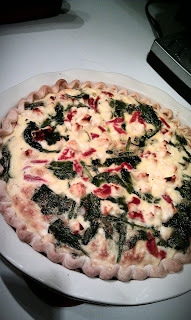 Add in a couple of handfuls of leftover fresh spinach, and it was really a nice, quick dinner ! Start water to boil for gnocchi. In a large saute pan, heat olive oil and saute onions just until soft. 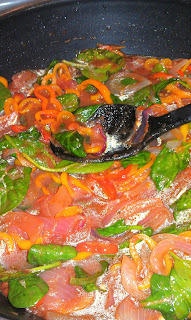 Add peppers and saute another 4-5 minutes. Add marinara sauce and red pepper flakes and simmer while you wait for your water to come to a boil. Cook gnocchi according to package directions. 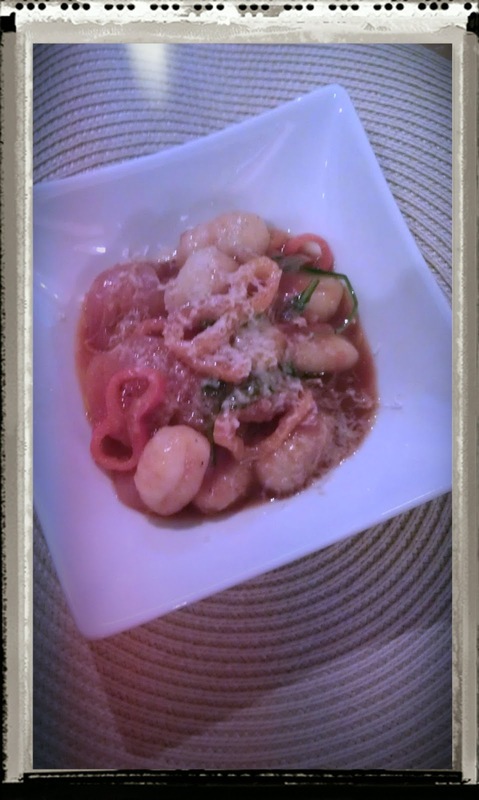 When you add the gnocchi to the water, add the spinach to the marinara sauce, and stir gently. When gnocchi is finished cooking. drain and stir into marinara sauce. Dish into individual serving bowls, and top with Parmesan cheese. I don't remember the first time I decided to make a savory bread pudding, but I do know it was to use up leftovers. I feel like many of my new favorite recipes have developed from a need to clean out the refrigerator. This would be one of those. I baked bread for Easter, this massive batch of spinach feta cheese bread, but it made 4 loaves, and there was no way we could eat it all before it spoiled. I put the remaining loaf and a half in the refrigerator, thinking I would figure something out. Well, we all know what happens when bread sits in the refrigerator for too long...dry, dry dry ! My only real option was a dish like this. I combined some smoky gouda and ham, and sauteed leeks to complete the taste. It would be good as a brunch option as well, but we had it for dinner. And lunch today as well ! Preheat oven to 400. Place bread in a large bowl. In a large saute pan, melt butter and saute leeks until soft. Add to bread and toss. Scatter ham and half of the Gouda cheese in with the bread mixture and toss to combine well. Spray a 9 by 13 pan with non-stick spray and place bread mixture in pan. In a separate bowl, blend together eggs, milk and spices. Pour over bread mixture and let sit for 20-30 minutes until bread is soaked. Bake covered for 45 minutes, then remove foil, top with remaining cheese and bake an additional 15 minutes. Remove from oven and let rest 10 minutes before serving. As many of my fellow foodbloggers have fallen victim to the stealing of recipes from their sites, I thought I would go on a little reconnaissance mission of my own. I think they would agree with me that I am perfectly happy for anyone to link to my site (I get a lot of mysterious hits from sites I didn't post on), but what I don't want is someone posting my original recipes or photos and pretending they are the source. So, I just randomly types in "Recipes" on Facebook, and picked one of the many recipe sites that had a lot of likes and followers. The largest one I found was one called "Fun Recipes". In their defense, they did have some recipes they linked back to blogs, but the preponderance of recipes and photos posted showed no original source. Either they have hundreds of people administering this site who do nothing but cook and photograph, or...they are stealing other bloggers content. Take a guess which one it is. "Friends, why do you ask? " So, I replied, "There has been a lot of publicity lately about the stealing of content on the internet. I guess I would feel better if there was a source listed. And if I was your friend, I would want my name attached to some of these beautiful pictures." The thing is, if you have a Facebook page, know the rules. Food bloggers work hard for the content. For some of them it is a springboard to a career. Letting you know there are rules that govern what you cut and paste. And you flat out lied when I asked the source of your recipes. Just give proper credit. Or it's plagiarism. Ignorance of the rules does not make it OK. I wanted to give you the chance to be honest about your content. Now I am giving you the chance to do the right thing. Honor the bloggers, their work and their recipes by giving them proper credit. And familiarize yourself with copyright law if you plan on continuing this page. No, there is a campaign against any who steal content. Did you look at the link I sent ? It's how I found yours. And for the record, I wasn't rude. You lied about where you obtained your content and I called you out. Just like any good publication, cite your source. YES MAM!!!!!! YOUR WORDS HAVE BEEN HEARD LOUD AND CLEAR!! and for the record I didnt lie i get tones of pics and recipes messaged every day.....i post all of them, I wont any more but don't call me a liar. Like the veiled threat at the end ? So, she knows who I am and where I live ? And I honestly think she thought it was OK if someone emailed her or posted a recipe just to leave it there regardless of the source. But, as the administrator of the page, she is responsible for its content. And ignorance of the law is no excuse. She isn't the only one. There are others....I may be on a mission. 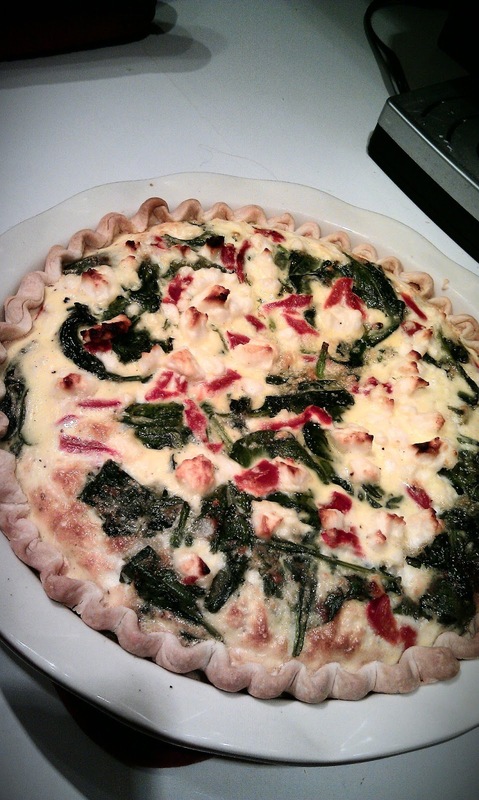 I don't know what possessed me to make quiche. I never do...well, only once before in my life. I think after a weekend of excesses (rich food, homemade beer and wine), I wanted something a little lighter for dinner. Then I start thinking of something I like to eat (spinach) and what might go with that...eggs. Somehow, that made its way into this really simple dinner. I had some yogurt on hand to use up, and decided to add that to my egg mixture rather than milk. It gave the interior a nice, creamy texture. I am assuming one entire quiche is supposed to serve more than 4 servings, so that is testimony to how much we enjoyed this ! Preheat oven to 425. In a large saute pan, heat up 1 tablespoon of the butter and 1 tablespoon of the olive oil over medium heat. Saute onions 2-3 minutes until soft, then add mushrooms. Saute an additional 3 minutes, then scoop the mixture into the pie shell. Add remaining butter and olive oil to the pan, then stir in spinach. Saute until just wilted, then add to the pie shell along with the onion mushroom mixture. 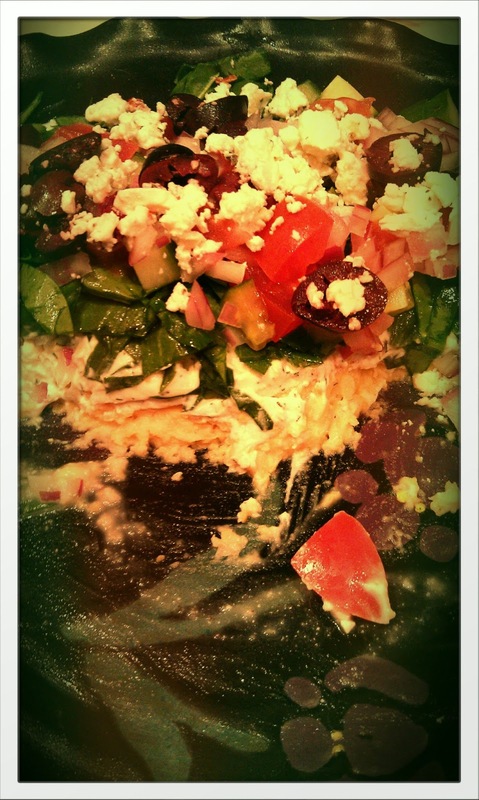 Sprinkle with roasted red pepper pieces, then feta cheese. In a large bowl, whisk together eggs, yogurt, salt and pepper. Pour mixture slowly into pie shell. Bake at 425 for 10 minutes, then reduce heat to 350 and bake an additional 35-40 minutes, until slightly browned on top and eggs are no longer "jiggly". Let sit 5 minutes before serving. I really have never liked the traditional Easter dinners. I just am not fond of the big, roast ham. And I am from a ham loving family so most often, Easter dinner seemed like, well, torture. 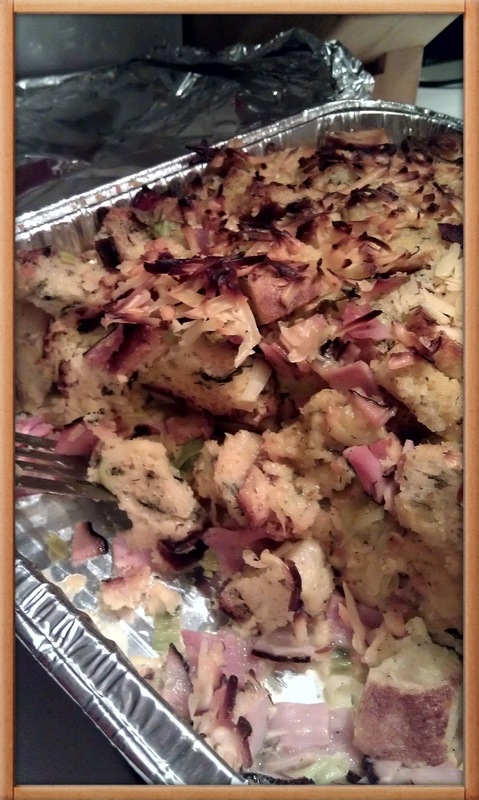 Even when I started having the family over to my home for the holiday, I felt pressure to serve them the ham they loved so much, knowing I was going to end up either cooking another main dish so I had something to eat, or eating only the side dishes. Then I met a very dear friend, Becky, who invited all of us over to her house on "Easter Saturday" for many years, and had a tradition of serving lasagna. I used to tease her about it, but there is really something brilliant about it. You can prepare pans and pans of it ahead of time, and you don't have to fuss with it the day of your event. So this year, when I was planning to have guests over the Saturday before Easter, I channeled my inner Becky to come up with a pasta dish I could prepare ahead of time, and still enjoy the evening with my guests. I had seen this dish on television several times, and liked the way it looked, but I wanted to make it my own. 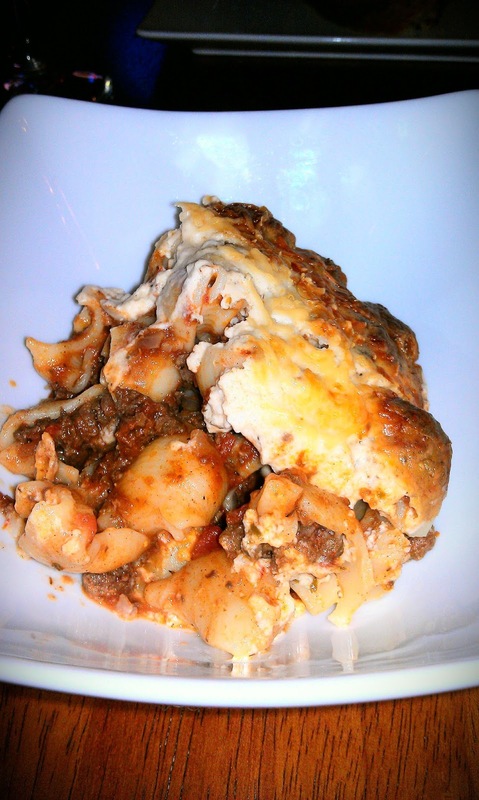 Pastitsio is a traditional Greek baked pasta dish, served with a cheesy bechamel sauce on top. Usually it is made with a combination of beef and lamb, but since we have a lot of venison, I used that as my protein. The sauce has cinnamon, nutmeg, allspice or some combination, so I played with those in coming up with this version. And I substituted a couple of kinds of goat cheeses to change the flavor profile a bit. It was soooo good, we couldn't stop eating it. I made a chopped salad and some spinach feta bread for the side, but I don't know if my guests cared. The pastitsio was THAT good ! In a large dutch oven, heat olive oil over medium heat. Add onion, and saute until translucent. Crumble in ground meat, and cook until completely browned, stirring frequently to make sure it is nicely crumbled. Add wine and spices, and simmer for 5 minutes. Add tomatoes, and simmer for 45 minutes to an hour, until the sauce is thick and bubbly. Turn to a simmer, remove 1/2 cup of the sauce, and let simmer while you prepare the pasta and the bechamel. Prepare pasta according to package directions, but cook until just under done, as you will be baking in the sauce. In a sauce pan, melt butter, and stir in flour. Continue to stir until smooth, then slowly stir in milk and cream, making sure not to get any lumps. Simmer slowly, stirring frequently until sauce thickens. Add goat cheese, and stir until smooth. Stir in spices remove from heat. Let sit 20 minutes, then add remaining ingredients. Preheat oven to 350.When pasta is finished cooking, stir into meat sauce. Spray a deep lasagna pan with nonstick spray, and pour in the pasta mixture. Gently pour on the bechamel, and top with the shredded goat cheese. Bake for 60 to 90 minutes, until golden brown and bubbly. Let rest 10 minutes before serving.